WASHINGTON — At first glance, it would have been easy for passers-by to mistake the Wednesday morning gathering on Donora Drive in Alexandria, Virginia for a block party. There, a crowd of about 30 gathered under a tent in the middle of the closed street and mingled over thermoses of hot coffee and boxes of fresh doughnuts. But it wasn’t a block party. It was a building party — to celebrate Habitat for Humanity of Northern Virginia’s 100th home. “This is the American dream,” said Mehrangiz Sadieva, who attended the morning event alongside hammer-wielding business executives from companies such as Freddie Mac, Leidos and JBG Smith. Sadieva knows, firsthand, the joy the new two-level house will bring to its future owners. Her family’s Habitat for Humanity home is also under construction just down the street. Currently, she lives with her husband and their two teenage children in a one-bedroom apartment in Alexandria, Virginia. “This future house that we have will tremendously change our lives. We will be financially more stable and secure, we will have a place to call our house … to have a different life,” Sadieva said. In the 28 years since the Northern Virginia Habitat for Humanity chapter launched, it’s provided local families with affordable homes, most of which are built by volunteers. This year, the nonprofit broke ground on its 100th house, which it plans to complete by next summer. “We’ve got more families than we possibly have properties for right now, so any time that we can afford to purchase (land or a property that needs renovating), it means another family is going to have safety and stability and financial hope, thanks to an affordable home,” said Margaret Anne Lara, director of engagement and marketing for Habitat for Humanity of Northern Virginia. How does Habitat for Humanity work, exactly? Families can apply to receive a home on the organization’s website, and candidates are nominated by the staff and selected by the board. Chosen families purchase their homes, pay a mortgage through an affordable payment plan and even attend financial counseling. Plus, they put in sweat equity. Lara said families that receive homes contribute up to 400 hours of time with the organization, framing, painting and working in the Habitat for Humanity store. 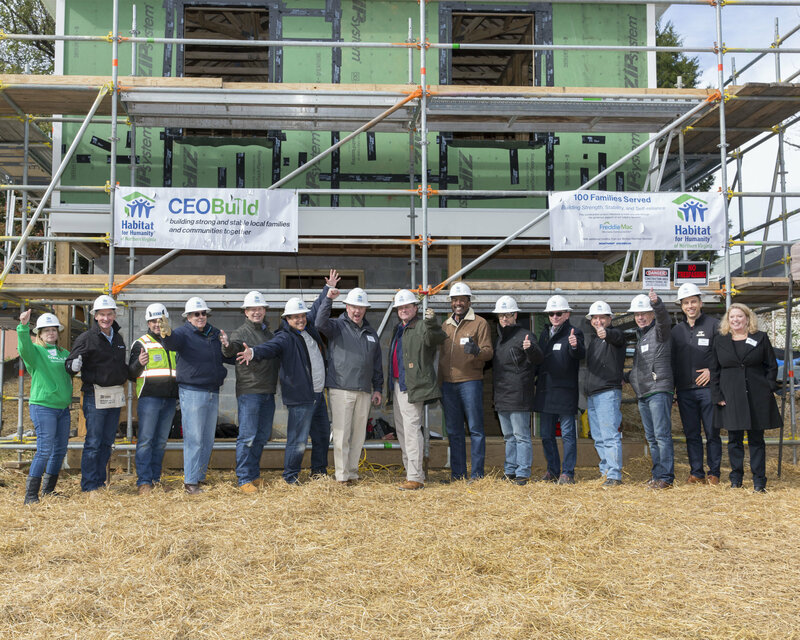 Noemi Riveira, director of real estate development at Habitat for Humanity of Northern Virginia, said the organization hires contractors to complete the electrical, plumbing and roofing components of the energy-efficient homes. Some even come equipped with solar panels — all in an effort to keep utility bills low for the homeowners. “We were just talking to a family a few months ago and they were telling us … they haven’t paid an energy bill for the last three to five months. And the last one they paid was about $30, which was one of the hottest months of the year,” Riveira said. 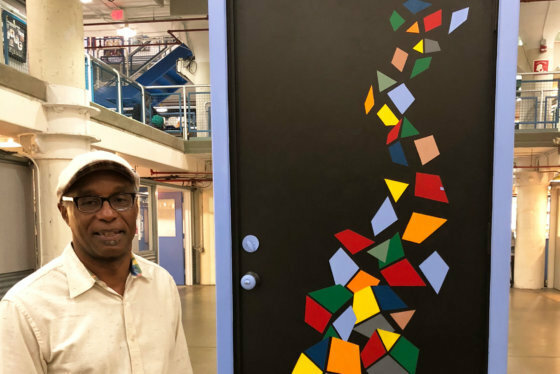 AJ Jackson, executive vice president of social impact and investing for JBG Smith, was one of the executives in attendance at Wednesday’s build. Jackson said his employer, a development company, has had a long-standing relationship with Habitat for Humanity, and it was nice to see business leaders from other sectors share a similar interest in creating more affordable housing. “It seems like within just the broader Washington business community, there’s more of a focus on the importance of housing affordability among non-real estate members of the business community, which is exciting for us because I think that creates the opportunity to get greater engagement and greater political attention to the issue of housing affordability, beyond just the traditional voices,” Jackson said. Future homeowner Sadieva said she has been blown away by the kindness of strangers throughout the Habitat for Humanity process. She is expecting to receive the keys to her new three-bedroom Alexandria home in July. “It’s good to know that there are such kind people who donate their time and just do good,” Sadieva said.